Benefits of Olive Oil: How olive oil can benefit your health? 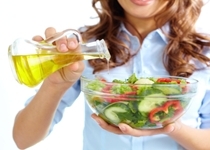 Home » Food and Nutrition » Diet » How olive oil can benefit your health? How olive oil can benefit your health? Olive oil has long been known to possess extraordinary health properties for humans. It is the main reason why the “Mediterranean Diet” is considered the healthiest diet on the planet. Rich in unsaturated fat, virgin olive oil is the best choice for cooking and for bread-dipping. A new study has gone further into our knowledge about what makes olive oil so amazing. It discovered that phenols (plant-based chemicals) in olive oil can change genes in our body that are involved in the ever-so-important inflammatory response. Older studies have shown that consuming high-phenolic olive oil could lower inflammation, blood clotting and oxidative stress (a natural consequence of oxygen distribution in the body, which can damage cells) in the body compared to olive oil with lower levels of phenols. But the new study differed in that it wanted to see if such effects could be linked to gene activity within cells. It was published recently in the journal “Biomed Central Genomics” and included 20 volunteers who had metabolic syndrome. This condition means you have a certain number of risk factors for heart disease, such as obesity, high cholesterol, and high blood pressure.Researchers fed the participants two virgin-olive-oil-based breakfasts, one at a time. One breakfast included virgin olive oil with high-content phenolic compounds (398 parts per million), while the other had a lower content of phenolic olive oil (70 parts per million). Everyone ate the same low-fat, carbohydrate-rich diet during both study phases. So, while these breakfasts with olive oil were consumed, researchers carefully monitored the expression of more than 15,000 human genes in blood cells after the meal. They found that 79 genes are dimmed, while 19 are turned up by the high-phenolic-content olive oil. Many of those genes have been linked to obesity, high blood-fat levels, type 2 diabetes, and heart disease. One key finding here is that several of the “dimmed” genes are known to promote inflammation. Thus, by turning them down, olive oil is in fact cooling off inflammation, which accompanies heart problems. This study helps shed light on why olive oil tends to reduce heart disease, as evidenced by the low levels of coronary problems among those living in Mediterranean countries. There, olive oil is an absolute staple of cuisine and the main source of dietary fats.